Entity that came to dialogue: Master Morganel, assisted by Johnakan Ur-El. Morganel: I have a lot of pleasure to be once again communicated with you. My name is Morganel and this ocassion is one of the few times that I communicate combined because I’m in parallel concept with Johnakan-Ur-El. Parallel Concept means that we have a combined lucubration with regard to a topic. As I already said in previous sessions, I am a researcher and many of my incarnated 10%s - in several ages and in different worlds- they have absorbed that eagerness of investigation based every time in order to excel more as human beings on Sun 3 or as another type of beings in other worlds. Always in terms of being able to offer the best thing to each civilization so that they can accept or not what one is going to offer. And why did I request the conceptual help from Johnakan? Because in this time we were lucubrating on the topic of “Chaos”. On this terrestrial world (Sun 3,) most of the people have a confusing concept of what Chaos means, they represent it like a whirlpool, like completed entropy, like everything that is destroyed, the opposite of order, destruction. I base myself on some sentences, for example: He sowed chaos. This Room looks like chaos. Then, most of the people relate chaos with disorder, with destruction. -The battlefield was chaotic-. They relate it to death. There is a tremendous energy condensation in each Big Crunch, but that doesn't end up being a nonexistent point as some physicists have believed to see. And it is not true that it is a point with infinite matter, infinite mass and zero space. One would be so naïve if one believes something like that. Firstly, it is not infinite matter. Secondly it’s not infinite mass either. And thirdly it’s not zero space. It occupies space. Anyway it is Chaos what surrounds that point. Most of the physicists, Johnakan-Ur-El is telling me, believe erroneously that when the universe is shrunk in that Big Crunch, Everything is shrunk. The Nothingness doesn't shrink. And now we will explain the reason. Because when that universe in the end of the cycle contracts (there is an expansion and then a contraction), that contraction includes matter and energy, but not Chaos. That is to say, the Nothingness. What there is beyond because when there is a new cycle, there is a new Big Bang and that matter is manifested over something. When the physicists study the first minutes of this universe, they are meaning that the universe was expanding. What they never have said it -because they didn't know it- is that it was expanding over... And not over something, but over the Nothingness, over the same Chaos. That leads us to think as humble researchers -although Johnakan denies he is a researcher- that today this gigantic universe still continues expanding over the Nothingness, which is what there is beyond the end of the same universe. It was also been said that at the beginning of the universe, not only space didn't exist, but rather time didn't exist either. There is a Mistake with this phrase! Error! And I can affirm it because time always kept existing. And I will explain it because I’m not interested in mysteries! -And How far the Chaos- that is to say, the Nothingness is extended? And there is the infinite. That is the infinite. A real infinite that mathematicians have approached theoretically, the same as the physicists have lucubrated it. It is an eternal infinite. Then we wondered the following question with this dear Master Johnakan because each answer brought the next question, always trying to ascend one step more in knowledge. God is neither outside nor inside of the universe, in the sense of this same universe, we as Spiritual Entities are manifestation of God, the same as the alternative universes, the parallel universes, and the superphysical universes. We are part of God; that is to say, the universe doesn't contain God. The universe is part of God. …And that led us to more questions. First: Is God also outside of the universe? And the other question: Where? And the second question: Is the Nothingness also part of God? Then I had an illumination simultaneously with Johnakan because with nanoseconds of difference we both received the information, - The answer can be wrong because we are spirits and we are fallible! - God is in the universe and God is beyond the universe and He is contained in the same one. The second question was: Is the Nothingness also part of God? God is Love; it would be one of the answers. The Nothingness doesn't contain Love. The Nothingness, literally speaking, doesn't contain anything. Then is it outside of God? Isn’t a contradicition? An absurdity because God is the Absolute, the same word says it, He is synonymous of Infinity. Beyond the Infinite there is nothing. But the same sentence is saying it! Because most of the beings don't know how to lucubrate between lines. Beyond the Infinite there is nothing. Then our answer for the time being is, and it is a temporary answer because we are investigating, or at least I have that nucleus that makes me investigate. It doesn't prevent me from being helpful to others, but each spirit has a characteristic, and since I have the humility to realize that a conceptual single nucleus sometimes is not capable to lucubrate everything, I united my concept to Johnakan’s concept at least for this research and we reached the conclusion that God is manifested in this universe, in all the alternate universes, in the 22 parallel universes, in the superphysical universes and at the same time is outside of Everything contained in himself. But beyond God there is Nothingness because I repeat it: God is Infinite, because he embraces Everything. Beyond the Infinite there is nothing. And I apologize for the pun that I take it as an advantage in order to transmit our conceptual language to the spoken language in the physical plane. If there is nothing, it means that the Nothingness exists beyond the Infinite. A Nothingness still dark, not dark from light, but dark from knowledge, dark from investigation, unexplored… We as spirits and you as incarnated beings have the habit of calling dark to what you ignore, to the vague things, to the distant things, to the cloudy things, and that is the Nothingness. That is the true Chaos. A Chaos on which it is necessary a lot more for us to investigate. A Chaos that was there from the origin. Then there is another question. Everything is cyclical and you developed a strip, which is a hypothetical strip that twisted and bounded has hypothetically infinite surface - I say hypothetically because it is not like that -, it is a tricky surface, the well-known Möbius strip or (Moebius band). Infinite in the sense that one can travel over it all the time and one never reaches the end. 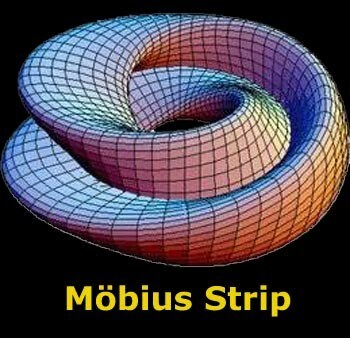 Time is like the Möbius strip, some "sages" explain, researchers, physicists, mathematicians... Will there be a moment throughout billions and billions of years when that last Big Bang fits, as if it were a cog, with the first Big Bang? Because if it is so, there would not be Creation. And if there is no Creation, When was God manifested? In which moment did God appear? Johnakan and I lucubrated the following thing: God is manifested in this universe with all the alternatives. Parallel universes, alternate universes, superphysical universes. He created Elohim, they created spirits, elves, goblins, angels, etc. Then a Creation exists. Then, there was a beginning, there was an origin. Then the famous theory that the universe doesn't have a beginning and an end is false! It is not real! There was a beginning! The issue is to know how to interpret the thought of God well and a lot of people don't know how to interpret it on this world and surely in other worlds don’t know it as well. Otherwise, He would not be Creator and He would be limited because He would be always along at the universe. Then there was an origin, there was an initial Creation, and here the question arises because to every intrigue, to every doubt, the question is mandatory. What was it before? Or was God alone? That is one of the unresolved questions, because Johnakan himself said a long time ago that at the beginning There was the Nothingness and the Whole. And that was translated into spoken language by his vessel, the 10% incarnated as Jorge Olguin, in his book Heaven Responds. At the beginning there was the Nothingness and the Whole. And being in parallel with Johnakan’s thinking, the same Johnakan affirms that he ratifies what was said. At the beginning there was the Nothingness (The Chaos) and the Whole (God). That is to say that God was there and the Nothingness also. In a certain moment for some reason that we still ignore, when I say that we still ignore, I mean that we will not always ignore it - I Hope so -, God decided to show himself over the Nothingness, expanding himself over the Nothingness, becoming Infinite over the Nothingness. But to conclude with this class that we have lectured, beyond the Infinite there is nothing. Thank you on my behalf and on behalf of the sublime Master Johnakan. Interlocutor: Thank you Morganel. Thank you Johnkan-Ur-El. Conversation between Jorge Olguín and Manuel M.
Jorge Olguin: I can only say that I’m overwhelmed. Manuel M.: Yes, it is incredible. (Laughing). Jorge Olguin: I can only say that. Jorge Olguin: I am proud of our Thetans, but healthily proud. Jorge Olguin: It’s not ego. It’s not vanity, but not saying I was proud, it would be hypocrisy. Manuel M.: Sure not recognizing that! Not recognizing the combined effort in order to lucubrate a huge problem like this, directly the problem of the origin of the universe. Manuel M.: The cyclicity* that exists where God is. I had never heard such thing! Jorge Olguin: Well, I’m thankful to my decoder that has allowed Morganel to be expressed along with Johnakan, obviously, without doubts, without hesitations, during almost half an hour without doubts. Well as I always say in English every morning when I cross the avenue. Thanks God! From now on, the word "Chaos" with capital letter will be used to mention what is beyond of the Creation of Eon. The word "chaos" with lower-case will be used when the meaning is related (disorder or confusion). The words "Whole" and “Everything” with capital letter will be used when they are referred to the (Creation of Eon) which includes the physical universe manifested, the 22 parallel universes, the alternate universes and the superphysical universes along with all the superphysical entities. The words "whole" and ”everything” with lower-case will be used to refer only to the physical universe as all, totality or continuum, since the scientists only mention the physical universe in this way, therefore, these terms will be used when they are related to the entire physical universe without keeping in mind the rest. The word "Nothingness" will be used with capital letter with the same meaning given by the word "Chaos" with capital letter. In reference to what is beyond the Creation of Eon. The word "nothing" will be used when the meaning is related to the absence of elements in the physical plane. This entry was posted at Monday, September 06, 2010 and is filed under Cosmology, Morganel, Paradigms . You can follow any responses to this entry through the .